I signed up to be a recipe tester for America's Test Kitchen a few months ago. Today I made this blueberry pie as a recipe test for them. Now, I'm not an expert pie baker, though I have made quite a few in my 40 some years of cooking. 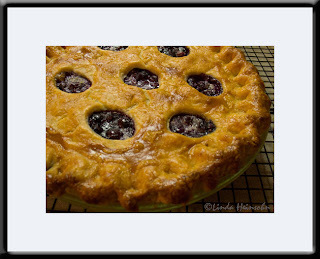 This recipe yielded a pie like no other blueberry pie I've ever made! The crust was amazing! Not burnt or dry. The filling stood up inside the pie and didn't leak all over or bubble all over and burn in the oven. The recipe called for a few unusual ingredients: shredded granny smith apple with all liquid wrung out. Also, ground tapioca. Also, half the berries were pre-cooked into a more thickened compote to which the other half amount of berries was then added. The amount of sugar was drastically reduced to one cup! Finally, a berry pie that wasn't too sweet or too runny! I am really proud of the finished product, as you can imagine!